What is the Midwest? There’s been a lot of debate about this question among folks passionate about such thing. But it defies easy definition. Here are eleven ways various people have taken a crack at drawing the map. 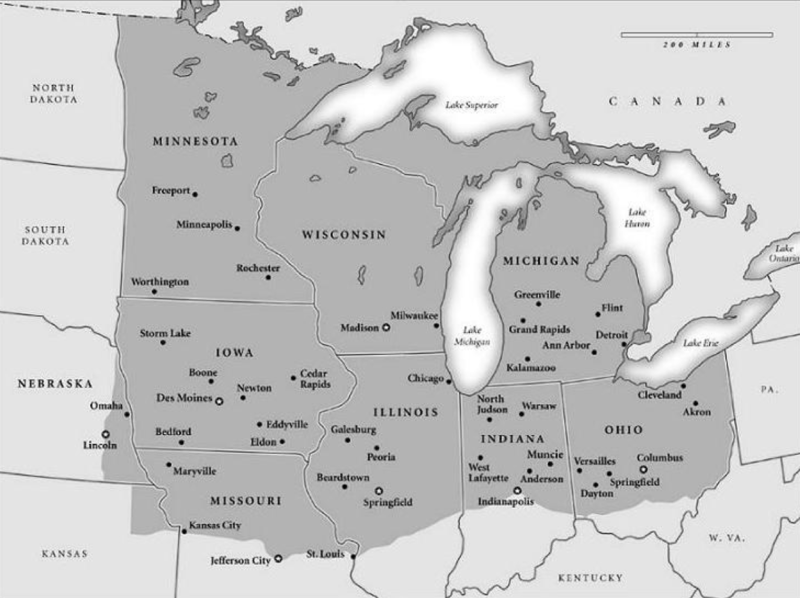 Start with the original Northwest Territory, now sometimes referred to as the Great Lakes region. This is the historic core of what we now think of as the Midwest. The Census Bureau has an official definition of the Midwest, which is one of four so-called “Census Divisions.” This is further divided into two “Census Regions” as in the map below. Others have attempted to draw maps based on shared ethnicity and culture. These tend to deny the existence of an actual Midwest as we think about it today. One of the most famous of these is from Joel Garreau, who made a claim that there were actually nine nations on the North American continent. 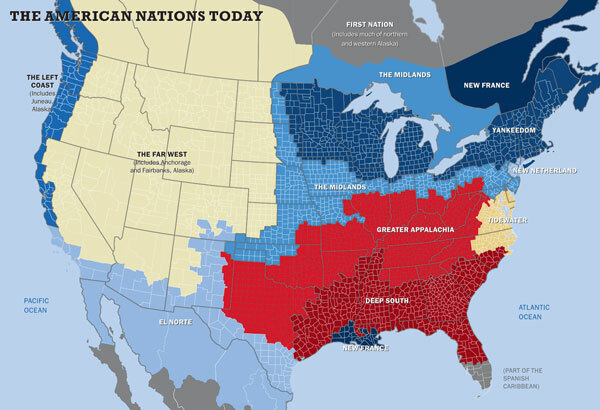 Colin Woodard took this a step further and argued that there were really eleven nations in North America, which he identifies based on settlement patterns. 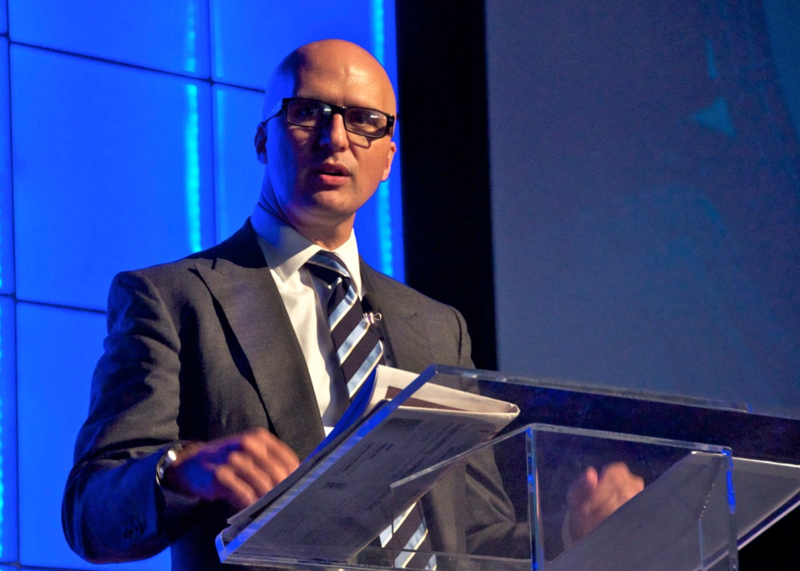 You can see his writeup on this in an article in Tufts Alumni magazine. 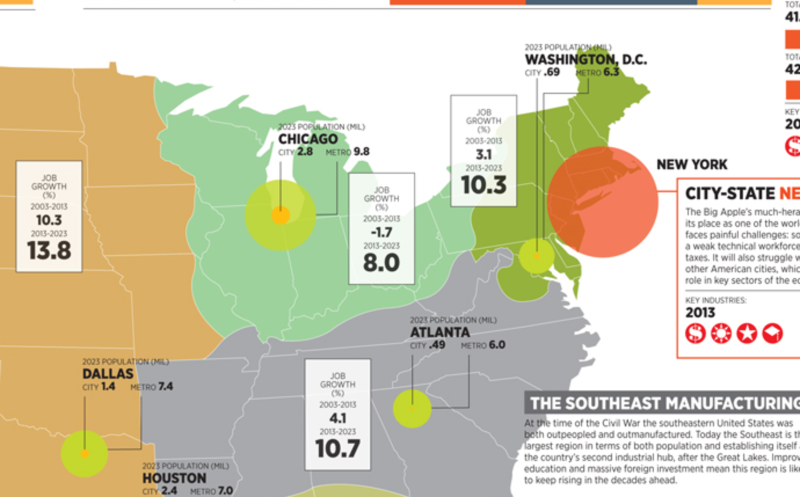 Other maps try to define a region based on shared economic characteristics such as industries. 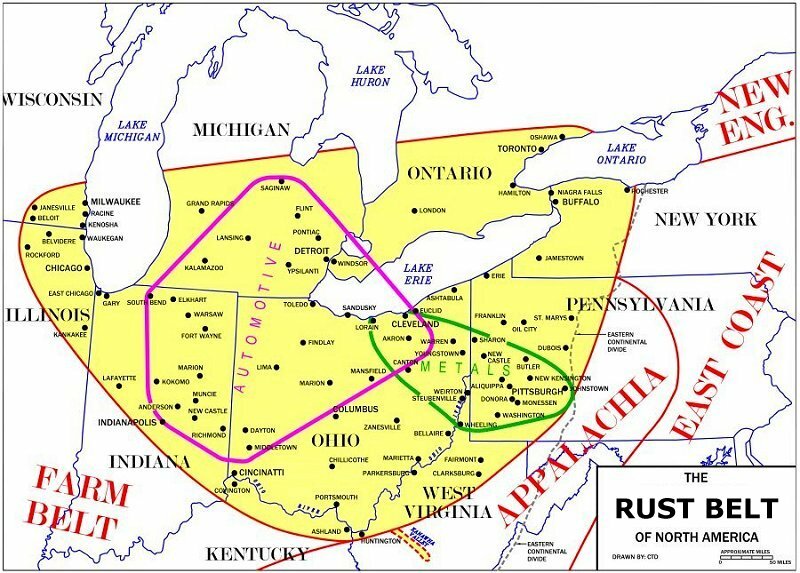 Here’s a map of the Rust Belt that’s floating around the I found on a website about coal communities of all places. I’m not sure exactly where it originated. 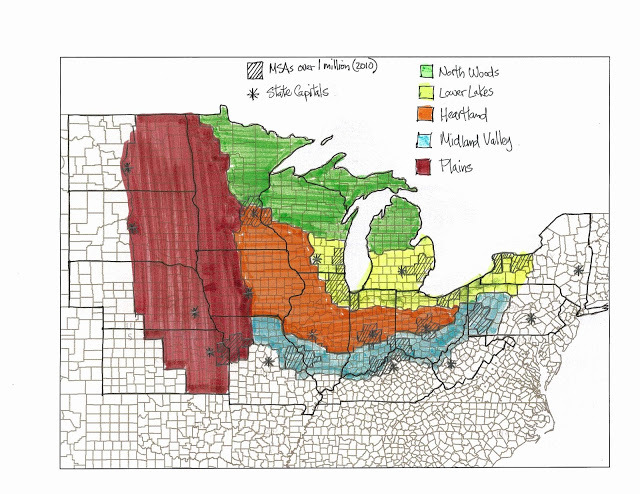 These maps attempt to use both shared cultural/historical and economic characteristics to define a Midwest region. In his very important book Caught in the Middle: America’s Heartland in the Age of Globalism, Richard Longworth created his own bespoke definition of the Midwest. 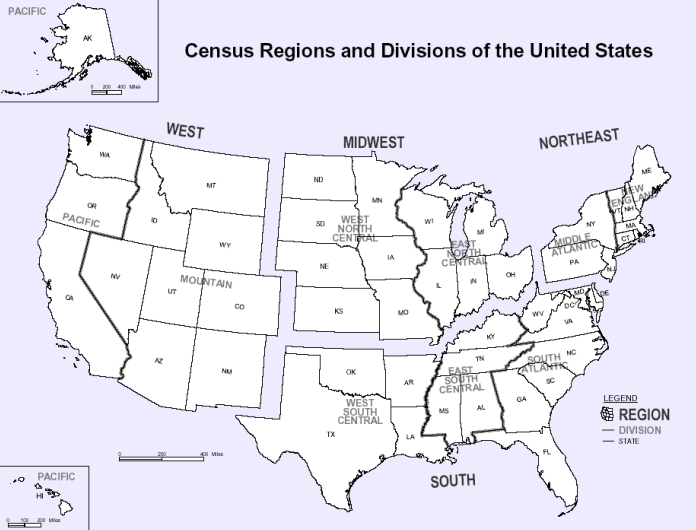 He notably excludes the southern regions of Missouri, Illinois, Indiana, and Ohio as extensions of the south (similar to the 9 & 11 nations map), and also the pure play Great Plains states along the western edge of the Census definition. 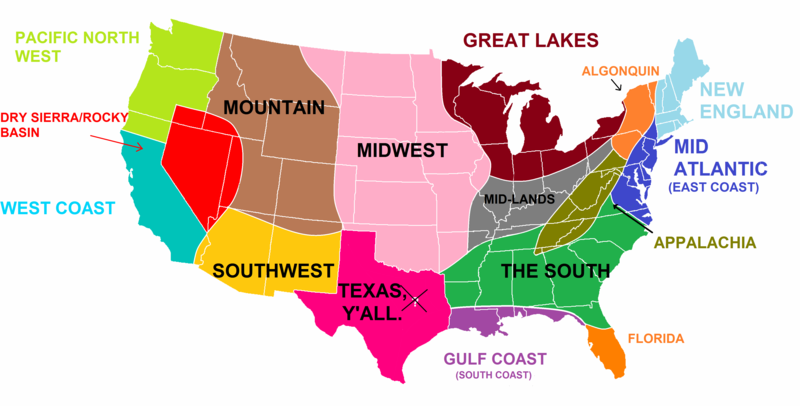 Pete combines the nations approach with the traditional Census definition of the Midwest in order to divide the Midwest into five sub-regions. Joel Kotkin took a similar approach to dividing America up in Forbes magazine. His view also appears to be a hybrid of culture, economics, and history. He turns America into seven regions and three city-states (New York, LA, and Miami). The full map is too huge to blog, but an excerpt is below which you can click on to see the whole thing in a new window. 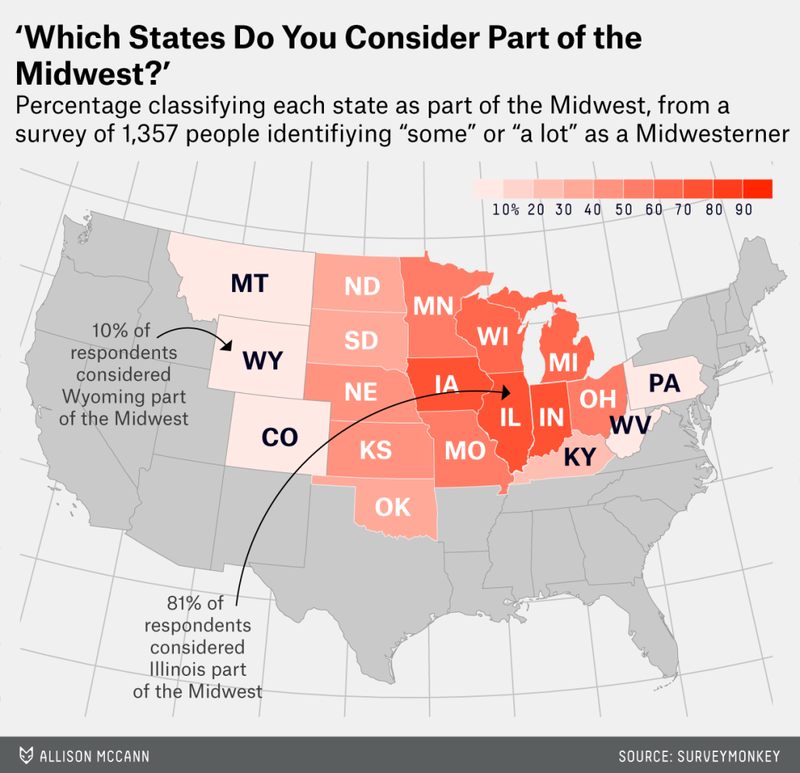 Walter Hickey, writing at 538, conducted a survey with Survey Monkey to ask people which states they thought were in the Midwest. Here’s what he came up with. Here’s one that I found on a Reddit thread started by user miguecolombia. It appears to be his personal take on how to divide America, with a strong dose of crowdsourcing from Reddit. 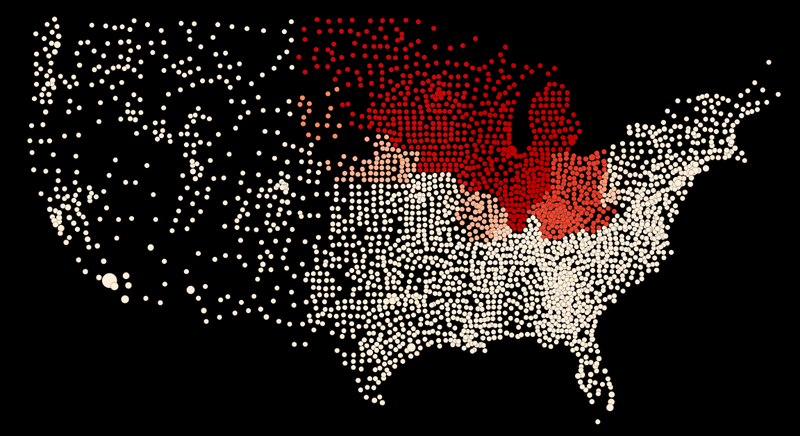 And a couple maps that try to use statistical techniques to let the Midwest map itself. 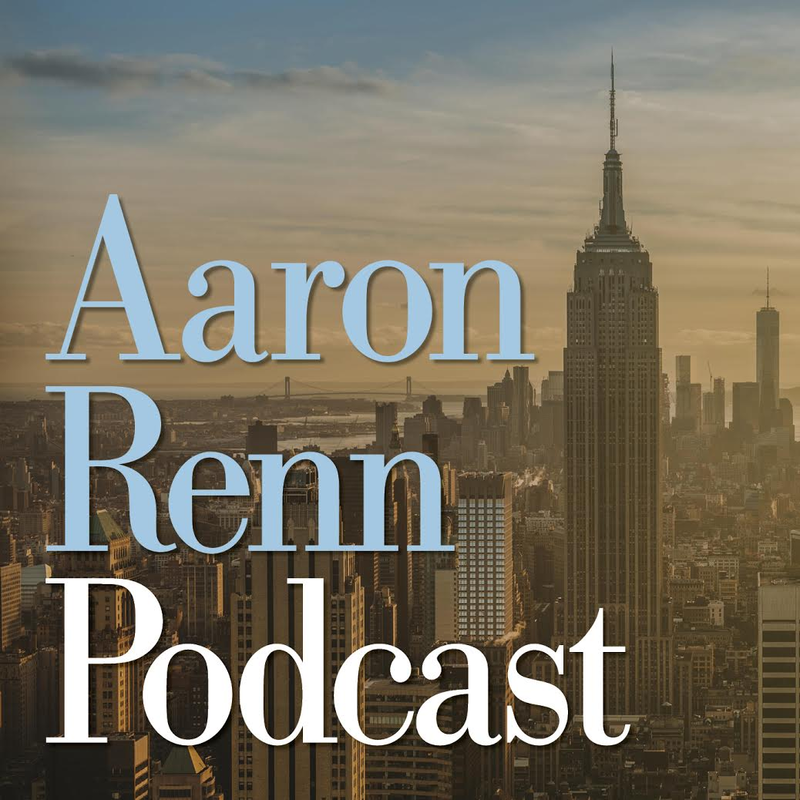 Pete Warden took a look at Facebook profiles and connections to create clusters of regions. Most of what we’d think of as the Midwest he called Stayathomia, which also covers much of New England. Lastly, a special surprise – a map you’ve never seen before. This was created by someone named Daniel Jarratt, who emailed it to me back in 2012. 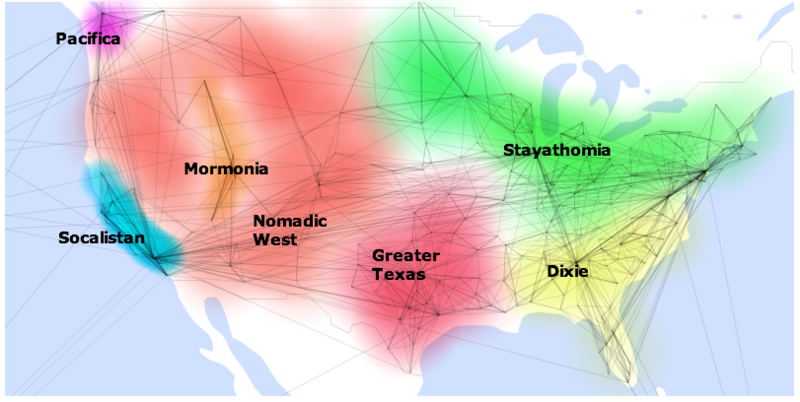 Using Chicago as the capital of the Midwest, he used IRS migration data and a statistic technique called modularity to divide the US into regions based on affinity with Chicago. Darker red means more connection to Chicago and thus in a sense more Midwest.